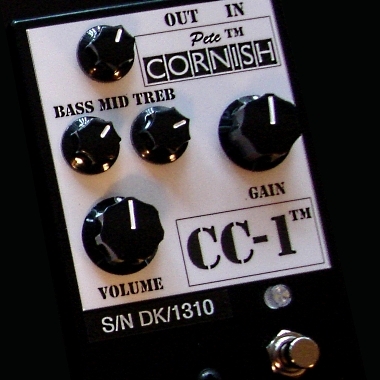 My new Cornish Crunch pedal, which has taken over a year to perfect, is available to order from January 2013 . The CC-1™ is not a variant of any existing product but a completely new and original design. The CC-1™ features two fixed low gain Soft Clipping Stages preceded by a variable gain (maximum +22dB) linear preamp to compensate for low output pickups and provide extra drive to the soft clipping stages if required. The advantage of using two low gain Soft Clipping Stages rather than hard diode clipping is that they are effectively (and automatically) removed from the audio path when the signal level drops below their transition point - ensuring a complete cleanup if the guitar volume is reduced. As the signal level increases due to stronger playing the soft clips gradually engage and start to add harmonics - more signal = more harmonics - but the loudness continues to increase as there is no clamping of the signal peaks. Dynamics are therefore preserved and superb musicality results. Following on from the Soft Clipping Stages is a three band active EQ using frequencies I have specifically tailored to suit guitars. Being active, the three tone bands can be both cut and boosted as desired with the zero or neutral point being 12 oclock on each control knob. I have included a second linear boost stage after the tone circuit to compensate for any reduction in overall volume when the tones are in cut mode. The benefits of this active tone circuit, compared to the usual passive (Cut only) tone circuit is that the three bands are completely independent and there is no inter reaction between the Bass, Middle and Treble tone controls. An output Master Volume is included to allow for perfect matching between bypassed and boosted/EQd signal level and there is plenty of signal headroom available to overdrive amp inputs if required. My well established Class A input buffer and radio frequency suppressor is, of course, included and the output buffer impedance is low; to easily drive long cables or other loads without loss of signal or tone. The above with Bass, Middle and Treble set to 50% (Neutral point). Maximum signal output with Volume 100% is +10dBm/ 2.5vrms/6v Peak to Peak. Housed in a Rugged Die-cast box with easy to set Number Knobs. Heavy Duty all-metal footswitch with Hi-Brite LED. An input for a DC adaptor is fitted: the size of the coax connector is 5.5/2.1mm and the centre pin is negative (-VE). The voltage rating of the adaptor should be noise free, fully stabilised at 9V DC and capable of supplying 20mA. We recommend the use of the Voodoo Lab Pedal Power 2 Plus adaptor as meeting the above criteria and cannot accept any liability for damage caused to this unit by the use of, or to, any other type of AC/DC adaptor. An adapter proving an output of an AC voltage should not be used as it will permanently damage the pedal: such damage is not covered under our warranty. If only a single unit is to be powered the BOSS PSA series may be more cost effective and is also recommended; but do not Daisy Chain other effects if using this adaptor as this may cause hum problems. This unit has been built using the finest available components and constructed to the highest standards but should any fault occur during the two years from date of purchase please return it post paid to the above address where under guarantee repairs of any original manufacturing fault will be carried out (normal wear, misuse, unauthorised modifications or accidental damage excepted). The warranty will be voided if the guarantee labels are damaged or removed. This warranty does not apply to customers own equipment, which has been connected to this unit. This warranty is not transferable. ©Pete Cornish Partnership™ 2014 E. &O.E.